On November 22, 1963 President John F. Kennedy was shot and killed in Dallas, Texas. No one then alive can forget where they were when they heard the news. The shock and sorrow of that event and the three subsequent days became embedded in the national consciousness. Images of the funeral, the boy’s salute, the widow’s composure, these are tucked away but never forgotten. Here you will find the story of those four days in November when a nation stopped to mourn. You will read the first person recollections of those of us who remember it all so well. Where we were and what we felt is part of this history. What is captured here is about this unique time, about the Kennedys, the Johnsons and Lee Harvey Oswald. The events of those days are sealed in an emotional time capsule shared by all who experienced them. Hopefully this will bring back those vivid days. For those too young to recall, this will serve to tell you about four tragic days in November of 1963. What is difficult is seperating the factual wheat from the conjectural chaff. So much controversy surrounds the Kennedy assassination. No attempt is made here to advance or refute any theory or point of view. Maybe we will never know for certain who killed John F. Kennedy. It’s important, but less and less as time passes and the assassins are either dead or ancient. What will never change is how his violent death impacted a nation. Our naivete was left on that street in Dallas. Many people feel that the Fifties actually ended on November 22, 1963. No more feel good days. Our sense of invinsibility had changed to vulnerability. Both those who supported Kennedy policies and those who opposed them were effected. At 43, John F. Kennedy was the youngest man ever elected president (Clinton was 46) and he embodied vigor and vitality. To see him shot down in his prime made us all feel defenseless. In 1963 we didn’t yet know about the shocks to come. We watched Robert Kennedy without knowing that he too would be shot and killed in less than five years. Looking at the pictures, the poignancy is increased knowing that now only Caroline now survives. Life in America during those four days came to a virtual halt as a nation sat, immobilized, glued to the TV. A collective sense of disbelief was made worse by the shooting of Lee Harvey Oswald. We wanted answers; we needed reassurance. We got neither. We did get some closure. The funeral of the slain John F. Kennedy was a masterpiece of decorum. It had just the right combination of pomp and personal. A state funeral thrown by a grieving family led by the stalwart brother and the dignified widow. 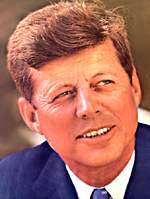 In the space of four days during November of 1963, John F. Kennedy transcended from being merely an American president to the more mythical position of King of Camelot. I don’t know. All I understand about forensics I learned from watching C.S. I. which makes me unqualified to judge. I read all these theories and find myself agreeing with parts of each of them. Always seems reasonable until you read the next theory. Americans don’t like to think that there could be a conspiracy to assassinate a president. That stuff happens in third world nations, not here. At the time we had a greater faith in what the government told us and when the Warren Commission said Oswald acted alone, we believed. So the reader can be clear as to this author’s perspective, here’s my 2 cents. Just because the investigation was flawed doesn’t mean that Oswald didn’t do it. Even if the single bullet theory is rejected, that doesn’t eliminate Oswald completely. I have a hard time believeing that Lee Harvey Oswald made that head shot. It was too perfect, too slick for a guy who looked like not all of his oars were hitting the water. Whether there was another guy on the grassy knoll or in the School Book Depository, I can’t say. Maybe. I never believed that the government did it. Those people cannot keep a secret. Maybe some government within the government but that is a bit like a made for TV movie. All these years I expected somebody to make a death bed confession. No such luck. The Kennedys were brash and made a lot of enemies. So maybe the Mob but again, it strains credulity to think that people whose friends have names like Freddy Five Fingers and Sammy the Slasher could pull off anything this efficient. Not without help anyway. Reportedly, John Kennedy was going to pull out of Viet Nam after his re-election. That would have cost somebody a bunch of money. Profit seems as good a motivator to assassinate a president as any. But who? I don’t know.